"Make It Funky" (Guitar Edition) published by Santorella Publications is a celebratory investigation of the classic, funk guitar sounds & styles of the FUNK ERA (1965-1980). 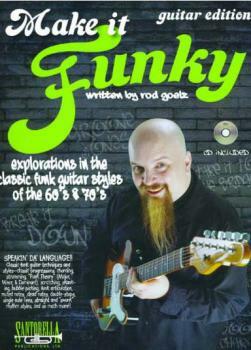 Within these 80 pages, you'll uncover the techniques & styles of the funk-guitar masters that made it all happen by introducing the essential vocabulary necessary for playing funk-guitar. This incredible assortment includes strumming, scratching, skanking, bubble picking, funk articulation, muted notes, dead notes, and "Swunk" styles. In addition, you'll build your understanding and application of funk-style harmony in major, minor & dominant styles. "Make It Funky" written by Rod Goelz is an absolute must for any serious guitar or bass student that likes to groove. The complete rhythm section performance accompaniment CD includes every example in the styles of those who made them famous. This fantastic collection features the styles of James Brown, Parliament, Funkadelic, The JB's, Kool &The Gang, Prince, Tower Of Power, Sly &The Family Stone, The Meters, Larry Graham, The Average White Band, Rufus, Maceo Parker, The Bar-Kays, Zapp, Bernard Edwards of Chic, Ohio Players, Chuck Brown & The Soul Searchers, The Brothers Johnson, The Fatback Band and other artists from the "FUNK" era.